Planting Dates: For spring, after all danger of frost. For fall, 12-14 weeks before first frost. In general, April 1 - April 30 and July 10 - July 31. 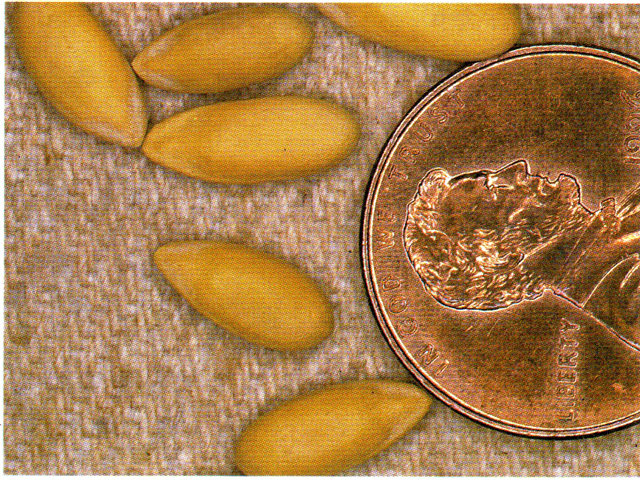 Planting Method: Plant 4-5 seeds ½-1 inch in hills every 18-24 inches on center in rows. Thin down to the two strongest seedlings per hill. Growth Habits: Climbing or crawling vine with yellow flowers and delicious fruit. Fruit primarily sets on secondary or fruiting branches that can be encouraged earlier by pinching out the tips of the primary tip growth. Culture: Plant on hills or raised rows. Needs healthy well-drained soil and full sun. Use 3-5 plants per hill. To conserve space, grow cantaloupe on trellises or cages. Cut back on irrigation as the melons mature and add lots of trace mineral products like Texas greensand and soft rock phosphate. Sidedress with organic fertilizer as the plants begin to vine and again when the fruit begins to set. If grown on trellises, fruit will need to be supported when melons reach grapefruit size. Troubles & Solutions: Poor flavor due to excess soil moisture. Powdery mildew, root knot nematodes, aphids, cucumber beetles, squash bugs, flea beetles, garden flea hoppers, and plant bugs. Lack of pollination and soil-borne diseases can also cause trouble. Most of these pests can be controlled with healthy soil and organic fertility. Harvest and Storage: The melons will slip easily from the vines when mature. Fruit on trellises may need to be supported to prevent damage when they fall away. Store the fruit after it is ripe above 45°. Will keep 1-4 weeks. Notes: Real cantaloupes have rough, wary skins and do not have the net-let texture. They are more oblong than round and not often grown in Texas. Some people like to pollinate by transferring the male flower pollen to the female flowers with a cotton swab, but that’s way too much trouble for me. 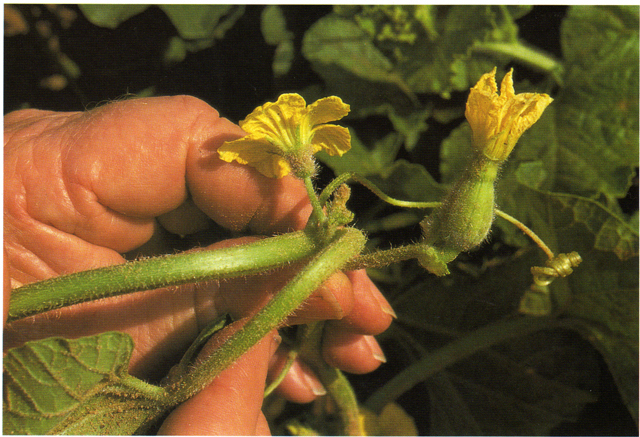 The female flowers have swollen, immature fruit just behind them.